What makes the waltz what it is? When we say 'waltz' we need to be specific. There are actually over 30 types of waltz. From the original Viennese waltz to more colloquial waltzes like the cross step and blues. 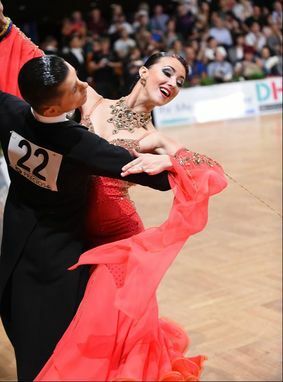 Often when we talk about waltz, we are referring to what has become the international standard waltz. It was once called the slow waltz or the English waltz. This is the form that we now most often see. It is very much about connection between the couple as they traverse the dance floor. Like all ballroom it has the romantic pose, it has a balance between travel and rotation to create a sense of escape and of course it has 3 beats to the bar instead of 4 like other danced. It is this last aspect that makes it so unique. By having 3 beats to the bar, there is a continuous change from left to right and symmetry that can be tricky to learn, but rewarding to master. This change of left to right also allows for a greater sway with the rise and fall to create that leaf on the wind look. If you want to look smooth and romantic, feel a deep connection to your partner and feel absorbed in the dance, then waltz is for you. No matter your interests in dance. The waltz is on of the classic that all dance students should experience. ​Come to Destine Dance and try a free trial dance lesson and see why the waltz is the classic of all the dances. The best way to see that Destine Dance is the best place for you to learn is the 6 week intro package.